Easy to hide... but so beautiful that it is a pity not to see them. The Bookshelves are based on a bass reflex construction ported to the back of the loudspeaker, in order to exploit as much as possible the wall effect. Facili da nascondere, ma così belli che è un peccato non vederli. Eleganti nell’estrema varietà di legni disponibili. Hanno un accordo di Bass-Reflex in direzione posteriore per sfruttare al meglio l'effetto parete. After some years of waiting we decided to reintroduce the Mini in our product portfolio. The Mini is a loudspeaker that was present longer time in the story of Blumenhofer. It was sometimes called Mini, then Satellite Mini and so on. The basis project never changed: a 2 way loudspeaker with a 10cm woofer in a rear ported bass reflex cabinet. The Mini has been already awarded in the past in France by the Haute Fidélité magazine the Best Buy award. It can work that modestly, that even a triode does not fail at his terminals. Its sound is involving, living and spacy. The Mini is a real bomb. An trustworthy and astonishing illusion. The stage is simply flabbergasting. The sound properties are globally really equilibrate. These are the most complete and surprising among the Minis on the market. Together with the Fun 13, the Fun 17 bears a Quarter-Wave-Length horn for the bass and a silk dome tweeter. The simplified structure and the compact form give a sustainable answer in sound and musicality. Maintained is the natural impression and the founded substance, that characterize a Blumenhofer loudspeaker. The Fun 17 is the top of what is feasible following the quarter wavelength and being able to be put in a normal living room. Assieme alla Fun 13, la Fun 17 è caratterizzata da una tromba del basso basata sul principio del quarto di lunghezza d'onda e da un tweeter con calotta in seta per i medioalti. La struttura semplificata e la forma compatta danno ad ogni modo una buona risposta in fatto di suono e musicalità. Rimane i'impressione naturale e la sostanza che caratterizzano qualunque diffusore Blumenhofer. There were the bass: full, stable and extraordinary deep. The Fun 17 produced an extremely trustworthy holographic total feeling. La Tempesta 17 è il nostro punto di partenza per la persona esigente. Coerente con le caratteristiche di una Blumenhofer, condivide il carattere ed il fascino degli altri diffusori. È in grado di entusiasmare sia nell'ascolto musicale che nella visione di un film. La membrana P2C® del mediobasso è una membrana a sandwich che consiste di 2 strati di Peek® (Victrex) iniettati di carbonio e pressati ad altissime temperature. Le caratteristiche sono la rigidezza e la bassa risonanza nel campo delle frequenze in cui è impiegato. The top expression of our Tempesta series. La Tempesta 20 è la più alta espressione della nostra serie Tempesta. The dry and deep bass was amazing to the excess. The Tempesta 20 is luckily no specialist, working on just special power amplifiers, it is a fascinating light to drive generalist. It was possible to listen at a very low volume and anyhow understand quite a lot. Groovy bass and rich voices. I diffusori della serie Genuin offrono una notevole qualità audiofila per autenticità e naturalezza. Senza dimenticare la loro adattabilità a qualunque tipo di amplificatore inclusi i valvolari più sensibili. Caratteristica comune di tutti i modelli è l'accordo in bass reflex abbinato ad una tromba dei medio alti con driver a compressione. The Genuin FS 3 MK 2 now bears much bigger components, we developed extra for it a new 10" paper woofer and the compression driver shows as well new membranes and a brand new horn, developed on purposes to match the compression driver behind it and the bigger woofer. Dopo circa 10 anni era necessario rivedere il progetto della Genuin FS 3: mancavano le nuove tecnologie. Volevamo introdurre la costruzione armonica ed… il nostro nuovo woofer. La Genuin FS 3 MK 2 ha componenti molto più grandi. Abbiamo sviluppato un nuovo woofer in carta da 10" - 25cm ed il driver a compressione ha una membrana più grande ed una nuova tromba, sviluppata apposta per abbinarsi al driver ed al nuovo woofer. Membrane dimensions: 44mm / 1,75"
The bass of the FS 3 is well defined, very dry and highly differentiated. Socially conscious grooving at late hours thus worked brilliantly and most chores can be readily postponed for the following day, can’t they? With Blumenhofer’s Genuin FS3 one doesn’t merely acquire a handcrafted piece of furniture made in Germany but an unusually lively dynamic performer of décor-friendly size whose transient/impulse fidelity is accompanied by an exceptionally airy treble and very high effortless resolution. Great dynamics and jump factor: Rhythmic fare gains in energy. First class. Even, low levels remain exciting because dynamic contrasts are retained. Nothing goes asleep. The stage is open and deep. The sound flows free even in minimal dynamic variations. The bass is sharp, fast and controlled. Dynamically fear these loudspeakers nothing not even the violent Grancassa. Seldom an acoustic guitar has been presented that convincing. It transfers damn original: such authenticity is rare. 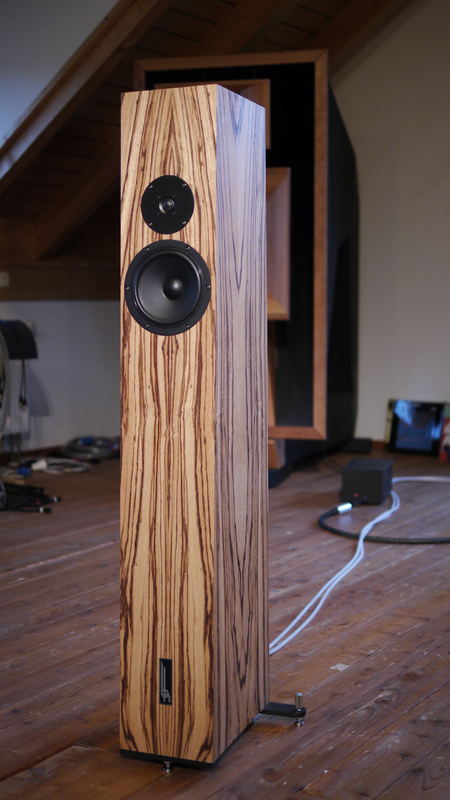 The Genuin FS 2 belongs to the best loudspeakers that ever came to my listening rooms. The Genuin FS 2 makes incredibly lot simply right. The fine dynamics capacities of the Genuin FS 2 are state of the art. Already with 20-Watt power amplifiers, the Genuin FS 2 is able to develop a firework of music. For friends of tube amplifiers it is a dream come true. Sitting still in my chair was not an option: the swing in the song moves my whole body and touches my heart. Suddenly the drum solo arrives and the Blumenhofers go wild with a big, live sound. No matter what you put into the Genuin FS 2, it will reproduce it with great ease, lots of detail, enthusiasm, a wide open stage and if needed a lot of subtlety. Each instrument is placed on its own spot and sounds the way it should do in its particular setting. Expectations were high, because of the earlier listening sessions and all I can say is that they were fully met. The new Genuin FS 1 MK 2 is a little bit more than a simple face lift of the 10 older Genuin FS 1. It is a big step forward in terms of construction philosophy and sound generation. This loudspeaker bears the technology introduced with the Gran Gioia and the Genuin FS 2: the Harmonic Construction and the floor ported bass reflex tunnel. This two technologies instead of suppressing all unwanted vibrations, harmonically directs them in a studied way. La nuova Genuin FS 1 MK 2 è qualcosa di più di una semplice revisione del progetto della sua antesignana, la Genuin FS 1. È un enorme passo in avanti per la filosofia costruttiva e lo sviluppo sonoro. Questo diffusore si basa sulle tecnologie già introdotte con la Gran Gioia e la Genuin FS 2: la Costruzione armonca ed il tunnel del Bass Reflex diretto verso il pavimento. Con l’uso di queste 2 tecnologie, la direzione costruttiva non mira più a sopprimere tutte le vibrazioni spurie, ma permette di dirigere l’energia in direzioni volute ed accuratamente studiate. The Genuin FS 1 MK 2 delivers even more of that stuff which we like, mainly Dynamics and Resolution. For Example with Nils Petter Molvaer […] the journalist sitting in the sweetspot was just able to groan with pleasure. Direct, defined and this lightness that projected the bass impulse with absolute ease in the room - everything there, where it should be. Male voices sounded sonorous, female voices open and free. This way it should be. The virtual space seems to be deeper defined and the visual description of the stage bore at the same time more focus and power. The famous horn coloration impressed by its absence. Allrounder at highest level - with the add on of the kick for speed, timing, dynamic and resolution. In the sum of the properties, I’ve never heard anything better in my rooms. The motivation of this series is to push the horn concept to further. The goal is to reach unprecedented and unsurpassed feeling of live music. Absolute dynamic and speed in all the matters of music. Unreasonable phantasies of audiophiles? You may think this, but listening to that will definitely change Your mind. Il motivo di questa serie estrema è sviluppare il concetto di tromba e riproduzione musicale oltre quanto è stato fatto finora. Percepire la dinamica e la velocità allo stato puro della musica dal vivo. Solo fantasie non razionali? Lo si può pensare, fintanto che non lo si è ascoltato! The Bass Phase Plug, the new horn throat construction, the further simplification, the new micrometrical regulation of the horn shift. This is about the technological steps further. La nuova tromba del basso con la nuova flangia, la nuova geometria per la gola della parte medio-alta, l'ulteriore semplificazione, la regolazione micrometrica per l'allineamento temporale. Questi sono i progressi tecnologici. Which is the horizon of a 2-Ways Loudspeaker? We decided to develop something that pushes this horizon beyond imaginable. The concept of horn and 2 way was what we decided to push to the limit. We set ourselves no constraints for dimensions. There have been several obstacles along this way and the prove that we mastered them is that the name Blumenhofer is on the Wiki. Qual'è l'orizzonte di una diffusore a 2 vie? Abbiamo deciso di sviluppare qualcosa che ampli in modo inaspettato questo orizzonte. Il progetto di un diffusore a 2 vie caricato a tromba è stato il naturale punto di partenza. Abbiamo deciso di non porci limiti dimensioni. Ci si sono presentati tanti ostacoli su questo cammino e molti sono stati superati. La prova è che abbiamo messo il nome Blumenhofer su questo diffusore. Goose bumps on both arms and shivers run down my back. Bass registers remind me of an angry grizzly bear. The sound stage is somewhere before you, certainly not coming from a pair of speakers, it feels and sounds like a bunch of speakers and every voice or instrument has its own identifiable position. The performance is very direct and micro details flow freely from the mouth of the horns. Whichever way you look at the system, it destroys many sacred cows, not just a bit, more like in an earthquake. Music is no longer reproduced; it is played at the very spot. The choice of each veneer starts walking in the wood, looking for the trees that might be transformed in noble forniture to come into Your rooms. All veneers are ecologically chosen and do not come from protected areas or trees. Choosing a special veneer You bring into Your living room not just a piece of wood, but a piece of the history of the places where that particular tree used to grow. A unique choice: there can't be 2 equal. The front side of the two cabinet building a pair of loudspeakers are carefully chosen and matched from 2, 4 or 6 following sheets of veneer of the same tree. Standard veneers are Cherry and Walnut. Normally standard veneers are deliverable on stock. Maple and Birch can be delivered on demand at standard price. Special veneers are Zebrano, Oak and special versions of the standard ones. Delivery delay is about 6 weeks. Premium veneers are Apple, Olive, African woods and special versions of Veneer "A". These veneers are really seldom. Normally not available or available on a chance based. Price and delivery delay only on request. La ricerca della nobilitiatura giusta inizia in lunghe camminate nei boschi alla ricerca dell'albero giusto che può essere trasformato in nobile arredamento per casa Vostra. Tutte le nobilitature sono scelte con un occhio di riguardo per la natura e non provengono da zone o piante protette. La scelta di un legno è un processo: non si porta a casa un pezzo di legno, ma un pezzo della storia del posto in cui è cresciuto il legno. Una scelta unica: non possono esisterne due uguali. La parte frontale delle casse che formano una coppia è scelta in modo estremamente accurato e quindi appaiata. Derivano da 2, 4 o 6 fogli consecutivi di nobilitatura ricavata dallo stesso tronco. Nobilitature standard sono Ciliegio e Noce. Di norma sono disponibili entro 2 settimane se presenti a magazzino. Acero e Betulla su richiesta senza sovrapprezzo. Nobilitature speciali sono Zebrano, Quercia e versioni particolari delle nobilitature standard. Di norma consegna in 6 settimane. Nobilitature Premium sono Melo, Olivo, legni africani e versioni speciali delle nobilitature "A". Queste nobilitature sono realmente rare. Di norma non disponibili o solo per caso. Prezzo e tempi di consegna solo su richiesta.